Less than a year after declaring the U.S. Navy "fully invested" in the service's much-hyped electromagnetic railgun, Chief of Naval Operations Adm. John Richardson is apparently experiencing some buyer's remorse over the $500 million supergun's troubled development. Appearing before an audience at the Atlantic Council on Thursday, Richardson characterized the decade-old weapons system � capable of accelerating a projectile to hypersonic speeds but stuck in research and development limbo without a ship-board tactical demonstrator � as "the case study that would say, 'This is how innovation maybe shouldn't happen.'" "We've learned a lot [from the project] and the engineering of building something like that that can handle that much electromagnetic energy and not just explode is challenging," Richardson said, per Business Insider. "So, we're going to continue after this � we're going to install this thing, we're going to continue to develop it, test it." "It's too great a weapon system, so it's going somewhere, hopefully," he added. That's quite an about face from the confidence Richardson exuded during a congressional hearing back in March 2018, months after Task & Purpose reported in December 2017 that the advanced system would likely never make it out of the R&D stage due to both the engineering challenges of actually mounting the thing on a Navy vessel and, more importantly, changing priorities within the Pentagon's Strategic Capabilities Office. 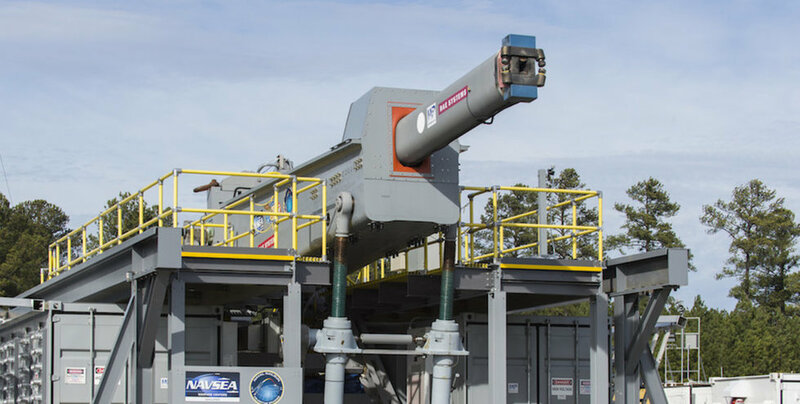 "[We are] fully invested in railgun; we continue to test it," Richardson assured lawmakers at the time, per Military.com. "We've demonstrated it at lower firing rates and ... shorter ranges. Now we have to do the engineering to, sort of, crank it up and get it at the designated firing rates, at the 80- to 100-mile range." Task & Purpose had previously reported that SCO was shifting its focus towards the hypervelocity projectile (HVP), specialized shells originally developed as the primary ammunition for the railgun that are just as effective when fired from conventional artillery. Indeed, the Navy test fired the HVP from the USS Dewey's Mk 45 five-inch deck guns during the 2018 Rim of the Pacific (RIMPAC) in August of that year. Richardson affirmed that shift in priorities on Thursday. "The high-velocity projectile is also usable in just about every gun we have. It can be out in the fleet very, very quickly independent of the railgun," he said. "So, this effort is breeding all sorts of advances. We just need to get the clock sped up with respect to the railgun." A year ago, Richardson attempted to assure lawmakers that, as Military.com put it, "death of the program was greatly exaggerated."